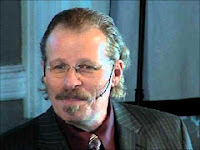 L.A. Marzulli is something of a legend in conspiracy circles, having made his appearance in numerous poorly produced documentaries and sensationalist TV and radio shows aimed at the most gullible among us. His deranged rants have also been extensively published in venues that publish such stuff (such as the WND, who refers to him as “Reporter and researcher”). Precisely what Marzulli thinks is sometimes a bit difficult to determine, but he seems bent on adopting whatever crazy combination of conspiracy theories, deranged religious fundamentalism and pseudoscience he encounters. Aliens are a big part of it, as is the return of Jesus. And apparently the theory of evolution is false. In general, the general tenor seems to be a perceived battle between Jesus and his devout followers on the one hand, and a Satanic horde of ancient alien lizard people, demons, the Illuminati and the UN on the other. Apparently aliens built piezoelectric teleporters in Peru in prehistoric times, and people with unusual head shapes are aliens and signs of imminent End Times. That kind of stuff. Marzulli is for instance one of many cranks who weighed in with nonsense on Comet Elenin – Marzulli maintained, with scant evidence beyond the malworkings of his own mind, that Comet Elenin is actually a “SUPERMASSIVE BLACK CARBON STAR” (perhaps this one). It isn’t. He was also host of the “documentary” series The Watchers, weighing in for instance on the evidence for the historical accuracy of the Nephilim. According to Marzulli, not only are the Biblical stories of the Nephilim accurate; they survive to this day. One of them was killed by American soldiers in Afghanistan. To back up the claim, Marzulli cites “rumors”. Apparently the powers that be have a vested interest in keeping the story under wraps: “If it points to the Bible’s narrative being accurate, they don’t want it;” in particular, “if it goes against Darwinian evolution, it’s not to be spoken of.” Ostensibly because “they” are secretly Satanists worshipping at the altar of Darwin. As for those piezoelectric teleporters in Peru: Apparently Marzulli has travelled extensively in South America, where he noticed some common, simple houses built out of tufa; the back walls of these buildings, apparently interestingly, had no windows. Therefore they were piezoelectric teleporters that ancient Peruvians used to zap themselves a thousand miles away. Apparently because aliens. He has also promoted the starchild skull nonsense (one of the more familiar out-of-place artifacts claims). The skulls in question were apparently tested by real scientists in real labs, but Marzulli obviously cannot reveal the names of these scientists for fear of persecution. Marzulli also hosts something called Acceleration Radio, which actually seems to enjoy some listeners. He is also the author of the Nephilim Trilogy; Politics, Prophecy & the Supernatural and the Alien Interviews. Cult leaders John and Glenys Darnell in Australia (truly scary people) seem to be heavily influenced by Marzulli’s teachings, for instance. Not only is Marzulli’s insanity popular in fringe conspiracy circles; he also enjoys quite a bit of an audience at the intersection between the Tea Party and the religious right (ok, that would presumably count as a fringe conspiracy circle). In 2013, for instance, he was a keynote at the Pikes Peak Prophecy Summit with the talk “On the Trail of the Nephilim: The Mysterious Skulls and Skeletons of Peru”. Other keynotes included Jonathan Cahn (“The Harbinger Continues & The Mystery of the Malkosh”), the WND’s Joseph Farah (“After the Harbinger: The Prophecy Continues”), no less, Stanley Monteith (“Secret Agenda”), Chuck “Peanut Butter Argument” Missler (“The Denizens of Metacosm”), Gary Stearman (“First Trump Last Trump: Defending the Rapture”), Mark Biltz (“Signs in the Heavens: Blood Moons Are Coming to Israel”), Bob Cornuke (“Biblical Archaeology: A Police Investigator’s Perspective”) and Bill Koenig (“The White House’s Role in Israel and the Middle East”). Diagnosis: Utterly deranged religious fundamentalist who has also adopted most of the whale.to-style conspiracy theories you could possible imagine – one step more deranged than the Alex Joneses of the Internet, in other words. Marzulli is nevertheless loud enough to have managed to attract an audience, but although he is perhaps not completely harmless, his impact zone remains fairly limited. Hey guys! I am a scientist, biologist and Messianic Jew. Why not listen to Marzulli with an open mind instead of a closed one? Darwin himself doubted his " theory" and to date, there has never been a missing link foynd. The Leakys, neo Darwinism has "infected" science with their pseudo science claims for over fifty years. No SERIOUS scientist can prove their theory. Instead of villifying Marzulli, open you tiny atheistic claims to perhaps engage in real science! Oy! "I am a scientist, biologist and Messianic Jew ..."
Nice try. If you were a biologist, you would know that "missing link" is an obsolete term strictly used by pseudoscientists. If you were a scientist, you would also know what the word "theory" means in science (which you evidently don't), and you would know the difference between "evidence" and "proof" and why the latter is not an interesting notion in empirical sciences. Moreover, that Darwin doubted his own theory is a creationist myth that even Answers in Genesis seems wary of propagating, and scientists have found plenty of transitional fossils (indeed, to be pedantic, all fossils found are transitional fossils). Finally, the post you are commenting on was not about evolution. It was about conspiracy theories and pseudoarchaeology. It's difficult to keep different thoughts apart, is it?